This is the kind of film that defines what this festival should be about: the spirit of collaboration between Israelis and Palestinians that completely defines any conflict or clash of cultures. 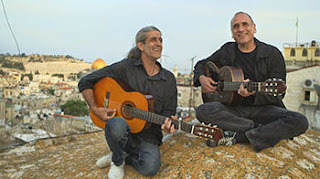 Its center is David Broza, a celebrated Israeli musician who achieves his dream of bringing together Israeli, Palestinian, and American musicians to record an album about the multicultural city of Jerusalem. For one American, it’s his first trip to Israel, and many breakthrough accomplishments are highlighted throughout the film, including Broza bringing music to a refugee camp inside Jerusalem. This documentary captures a spirit of collaboration that transcends differences, and the excitement felt by all parties involved is palpable. Hearing each participant talk about past experiences and surprising discoveries about the similarities between peoples is inspiring, and ultimately it all boils down to the power of a shared interest to break down boundaries.